The Blues will play the first of two preseason games against the Stars on Sept. 18. St. Louis Blues fans will have three chances to see the team compete at home this September. The Blues announced their seven-game 2018-19 preseason schedule Friday. The Blues will open preseason Tuesday, Sept. 18, against the Dallas Stars at American Airlines Center. The Blues will host three preseason games at Enterprise Center, including Friday, Sept. 21, against the Columbus Blue Jackets; Tuesday, Sept. 25, against the Stanley Cup champion Washington Capitals, and Friday, Sept. 28, against Dallas. In addition, the Blues will participate in a neutral-site game against the Minnesota Wild on Wednesday, Sept. 19, in Des Moines, Iowa. 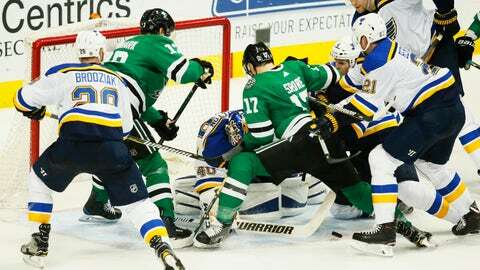 Sept. 18 @ Dallas Stars 7:30 p.m.
*Sept. 19 @ Minnesota Wild 7 p.m.
Sept. 21 Vs. Columbus Blue Jackets 7 p.m.
Sept. 23 @ Columbus Blue Jackets 2 p.m.
Sept. 25 Vs. Washington Capitals 7 p.m.
Sept. 28 Vs. Dallas Stars 7 p.m.
**Sept. 30 @ Washington Capitals 5 p.m.